In most watersheds (river basins) in Florida the interactions between ground water and surface water typically result in a single dynamic flow system. This direct hydraulic linkage results from numerous karst features (such as sinkholes, conduit systems in the underlying limestone, and springs) that facilitate the exchange of water between the surface and subsurface (fig. 1). Unique problems can arise in protecting water quality in karst areas because of the direct and rapid transport of recharge through conduits to the subsurface and through resurgence by springs. In some areas, recharge from unknown drainage pathways to areas of discharge may contribute to chemical and biological contamination of water supplies. Such contamination in karst areas has been documented by many studies. Drilling through that kind of geology could easily provoke a frac-out and collapse into the Florida Aquifer. Elsewhere USGS has spelled out that groundwater depletion can lower well levels as far north as Cook County, as well as producing sinkholes. The vast amount of information that has been gathered on ground-water and surface-water systems in the Suwannee River basin provides an extensive data base from which water-resource managers can begin to understand the importance of the hydraulic and hydrochemical linkage between ground water and surface water in the basin. It is unlikely that adequate State and Federal funding will be available, in the foreseeable future, to conduct statewide delineation and mapping of zones of interaction between ground water and surface water. One solution to this problem would involve the establishment of watershed coalitions, involving the private sector stakeholders, that could be responsible for generating the necessary resources for proper watershed assessments. The watershed coalitions will benefit their communities by participitating in, not only identifying, the threats to watersheds health and function, but also by being a part of the solution to existing problems. The biggest invasive threat to WWALS watersheds and the entire Suwannee River basin right now is the proposed Sabal Trail fracked methane pipeline. 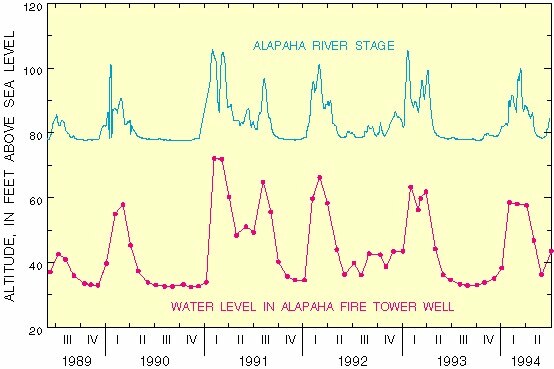 This entry was posted in Aquifer, Basin, Pipeline, Quality, Quantity, River and tagged conduit systems, conservation, contamination, discharge, drainage, Florida Aquifer, Georgia, John S. Quarterman, karst, limestone, Lowndes County, north Florida, pipeline, Quantity, resurgence, river, Sabal Trail Transmission, sinkhole, south Georgia, Spectra Energy, spring, Suwannee River, USGS, watershed, Withlacoochee River, WWALS, WWALS Watershed Coalition on May 4, 2015 by jsq.